Canterbury Christ Church University’s School of Music and Performing Arts is organising a conference on the music of Sir Peter Maxwell Davies, to take place from Friday 2 to Saturday 3 March 2018. 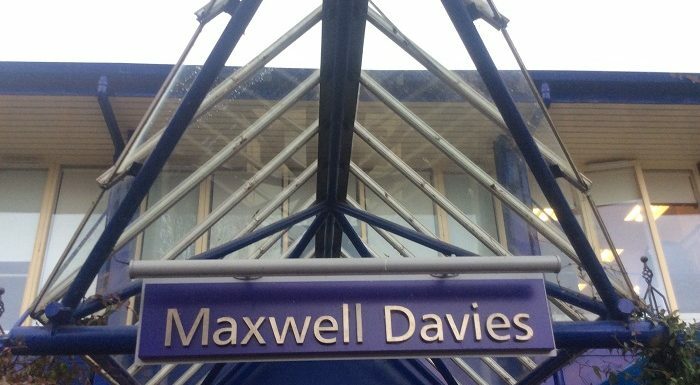 Maxwell Davies was a Visiting Professor at the university and was awarded an honorary fellowship in 2006. His ten Naxos Quartets were written especially for the Maggini Quartet, the university’s quartet in residence, which is led by Senior Lecturer in Music and conductor of the University Symphony Orchestra Martin Outram. Dr Nicholas Jones, the composer’s biographer and editor of his selected writings, will give the keynote presentation entitled For the Islands I Sing: Composing the Orkney Landscape on Saturday 3 March. Seminar sessions will explore Maxwell Davies as an environmentalist, letters of the young composer, analysis of his works and perspectives on performance. On the afternoon of Friday 2 March, the conference will begin with a recital featuring the composer’s solo and chamber works, including A Kestrel paced around the Sun and Lullaby performed by the Assembly Project. Alasdair Nicolson, Director of the St Magnus International Festival founded in Orkney by Maxwell Davies, will introduce the UK mainland premieres of the prize-winning pieces from the festival’s Composer’s Competition. There will also be a specially commissioned installation entitled For the Islands I Sing created by the university’s MMus composers and directed by Alistair Zaldua. Registration for the conference costs £10.00, but is free for students of Canterbury Christ Church University’s School of Music and Performing Arts and members of the Royal Musical Association. View the full programme and book tickets here.